Ideal for business and leisure travelers alike, this Red Deer hotel in Alberta is conveniently located near shopping, recreation and corporate offices. No matter what brings you to Alberta, you're sure to find something for everyone. 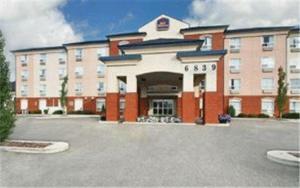 This Best Western hotel in Red Deer is close to premium shopping at Parkland Mall and bustling downtown. Outdoor lovers take advantage of close proximity to the beaches of Sylvan Lake and the Canyon Ski Area, while sports fans don't have to go far to catch a game. The Collicutt Centre, the Dawe Community Centre, Westerner Park, Kinex Arena and the Annie L. Gaetz Ice Skating Rink are often packed with athletes of all ages and sports. Our business guests will appreciate the on-site boardroom for small business meetings, in addition to this Red Deer, AB hotel's easy access to local businesses, including those at Edgar Industrial Center and Westerner Park. Also, the BEST WESTERN PLUS Red Deer Inn & Suites has easy access from the highway and is just 125 kilometers from Calgary, allowing for quick day trips into the city for conventions and sporting events. Each well-appointed guest room at the BEST WESTERN PLUS Red Deer Inn & Suites features high-speed wired and wireless Internet access, an in-room microwave and mini-fridge, comfortable pillowtop mattresses and an ergonomic desk chair perfect for working or relaxing. Unwind and enjoy in-room movies, satellite cable on a flat screen TV and complimentary local calls and newspapers. For the ultimate in spacious luxury, be sure to ask about Honeymoon or Whirlpool Suites. 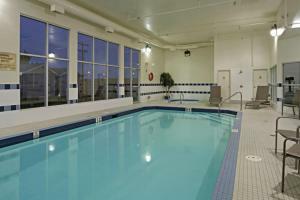 Guests can start each morning at the Red Deer Inn with a complimentary full breakfast, and then they can take a swim in our indoor pool and whirlpool or enjoy our exercise facility. Our hotel in Red Deer is also pet-friendly! Our friendly, welcoming staff members are ready to welcome you to this exceptional Red Deer hotel. Book a stay and save today with the BEST WESTERN PLUS Red Deer Inn & Suites.